I am really excited that writing curriculums in schools don’t just focus on narrative and persuasive writing. 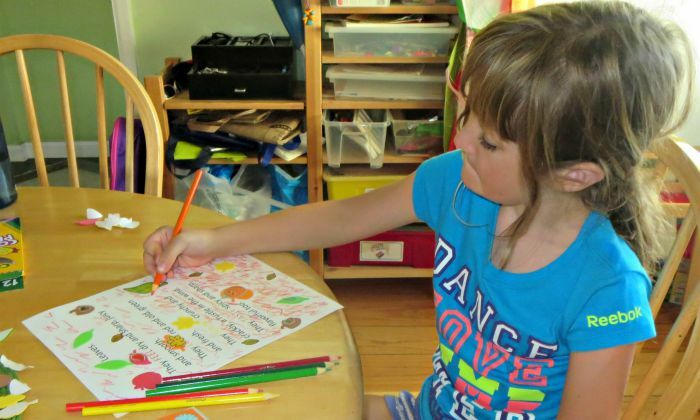 In second grade, Smarty learned to write acrostic and sensory poems. She was happy to demonstrate her skills for me when I asked her to write some poems about leaves. Why Is Reading and Writing Poetry Important? In elementary school kids are taking control of both grammar and vocabulary. Poetry forms with specific rules, such as haiku or acrostic allow them to think of words in a different way, focus on the beauty of the form and on choosing just the right words for their poems. I think acrostic can be especially effective in brainstorming words that fit the topic of the poem and start with the right letter. 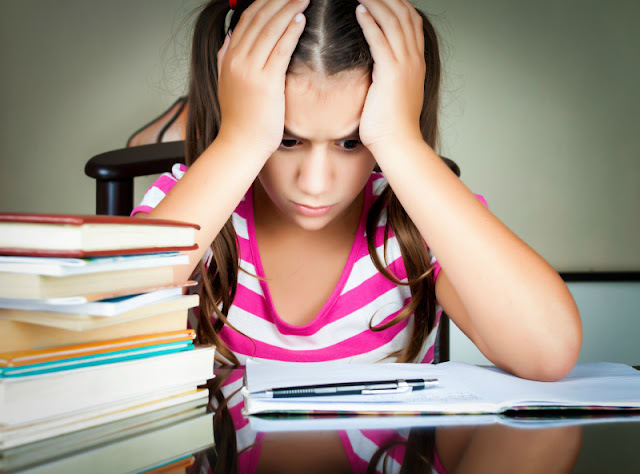 Writing poetry can be an amazing creative exercise for verbally gifted students allowing them to stretch their vocabulary and sentence building skills. And the result is just plain fun! 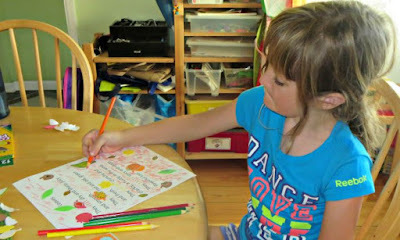 Sensory poems can be helped by a graphic organizer. I wrote about them in this sensory poems post last year. This time Smarty didn’t use an organizer, and one sense is missing. She said that she remembered about smell, but she sort of combined her sensory taste and smell experiences together in her sensory poem about leaves. They FEEL dry and sharp, juicy and smooth. They LOOK red and old, green and fresh. They SOUND crunchy and crackly, a rustle in the wind. They TASTE spicy and sharp, flavorful too. Somewhere and everywhere, they are there. Smarty typed up her poems on the computer and was willing to illustrate one. She was certainly not in "less is more" mood when she did that! She explained to me that she wanted to express the "whirliness of leaves" in her illustration. She was pretty happy with the result that you can see in the image below. More Poetry Ideas for Kids? 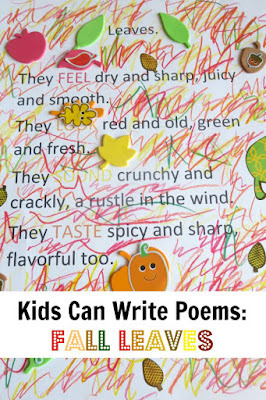 Check out a great site Poetry for Kids to introduce kids to various poetic genres. Do your kids write poetry? If her illustrations are any indicator, I'd say poetry inspires her creativity! 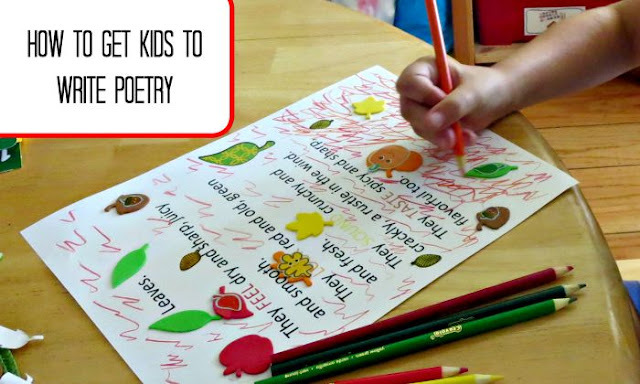 This is such a great way to encorage kids to write poetry. Beautiful way to explore fall leaves! Princess would be very happy if I did a poetry unit..... Maybe with Shakespeare?